I’m always searching for new and interesting lunch options and this recipe is a product of one of those searches. I tend to have lots of odds and ends left in my fridge after a week of recipe testing. One afternoon, while searching for lunch fixings, my fridge offered up a half empty carton of ricotta, some loose radishes, and a bounty of fresh herbs at which I’d been picking all week. They came together into a very satisfying lunch for one. With a few tweaks here and there, this elegant lunch recipe was born. If you’re serving this as lunch, I’d serve two slices of toast with a side salad. If adapted for a sit down summer appetizer, one slice of toast per person is plenty. Place the bread slices on a large rimmed baking sheet. Grease each slice on both sides with cooking spray. Sprinkle with sea salt. Bake until lightly browned, about 10 minutes. In a large bowl, mix the ricotta with the dill, parsley, mint, and lemon rind. Season well with salt and pepper. 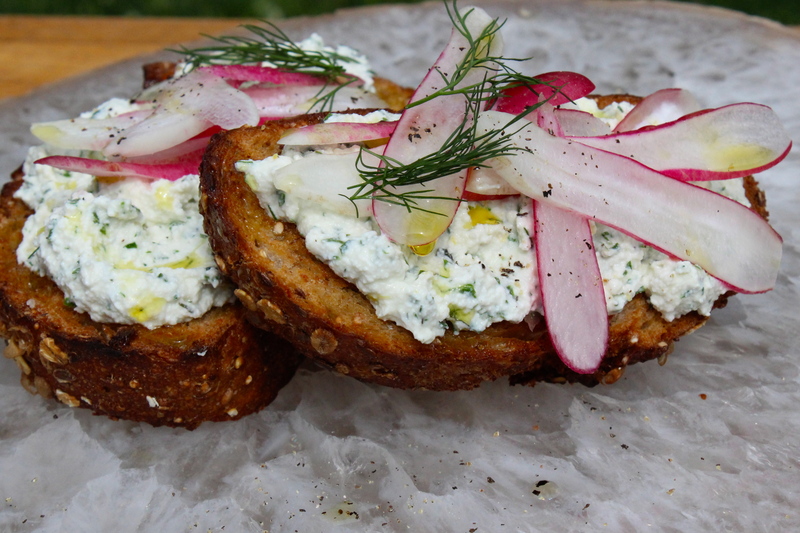 Top each slice of bread with a 1/4 cup of the ricotta mixture, top with a few radish slices and drizzle with oil. Finish with cracked black pepper and serve. This entry was posted in appetizer, lunch and tagged appetizer, lunch, radish, ricotta, sandwich, toast. Bookmark the permalink.